School is almost out for the summer! If you have kids in school you're probably running around relishing in these final days of "alone" time before the kids are home. Hitting up Homegoods? (Please and thank you!) Getting a mani/pedi? (You better be!) Perhaps you're frantically goggling any and all camps in your area while LockUp: San Quentin plays on tv? (That's me with my high brow television, obvi.) I myself am obsessed with vacation bible schools. They are the UNSUNG HERO of the summer. They're cheap, they're faith-based, and they're short. Just a few hours a day, enough to feel like you DID something, you know? Like, "I accomplished something by dropping you at 9 am and picking you up at noon, children. Chick-fil-a and Paw Patrol....FOR EVERYONEEEEEEEEEE!" They're signed up for 934809328290309 this summer. Personally, I'm looking forward to summer break. And yes, I will miss taking my "Which Dog-Breed Are You?" quizzes in silence, but I'm happy to not be so scheduled. (Editor's Note: I am a Poodle. Are you surprised???) I'm def not on top of my mom game lately. A prime example of this was last week for Poppy's dance recital after school. The school called me at 1:40 asking if I was coming and if I was OK. I was like ????? the performance doesn't start until 1:45! (We shall ignore the fact they were alarmed that I had forgotten Poppy's lunch that morning and just never went back to drop one off...woopsies!) ANYWAY, it was raining but I was pumped I was there right on time. However all the other parents who are better humans than me had gotten there a few minutes early. They were happily in their seats, iPhones ready to record. I come in rainy, messy, lugging my giant purse and my giant Margaux. Everyone stares. They were literally waiting for ME. AND THEN I look over at Poppy and I don't really recognize her. Was she in the powder pink ballet outfit with matching tights I had gotten her? No. Was she in a Lost & Found hot pink zebra tunic that was too short for her and didn't have any pants on? Yes. Yes she was. I'm like, "PSSST! POPPY! WHAT ARE YOU WEARING AND WHERE ARE YOUR TIGHTS?!" And one of the nice moms heard me and said, "I helped her get dressed and she told me she didn't want to wear tights soo....." I'm like sooooooooooooooooooooooooooooooooooooooooooooooooo we just didn't put any leg garments on her???? She also doesn't LIKE to brush her teeth, or wear a seat belt or TAKE NAPS, but do we listen to her? NO!!! Que the performance starting which was a 40 min haze of Poppy mooning people in her white (stain free, GLORY AND PRAISE) undies. And these littles don't just twirl around like normal ballet kids. They have to be down on the ground jumping like frogs and really using their WHOLE BODIES, if you catch my drift. It was bad. And it killed me to see so many parents recording the thing, and now Poppy will be FROZEN IN TIME doing the no pants dance. I showed my sister a short video I took (I won't shock you with the footage) and she says, "Yeah she definitely doesn't look like the other kids. She sort of looks like someone's cousin whose visiting, or something." TRUER WORDS WERE NEVER SPOKEN. TIME FOR SUMMER. Anywayyyyy, if you have a lot on your end of year To Do list, I'm here to help! I've complied a list of ideas for end of the year teacher gifts. I asked my teacher friends and my teacher husband what teachers like the most. And because our kids' teachers are the best and they deserve some fun gift ideas! 1. 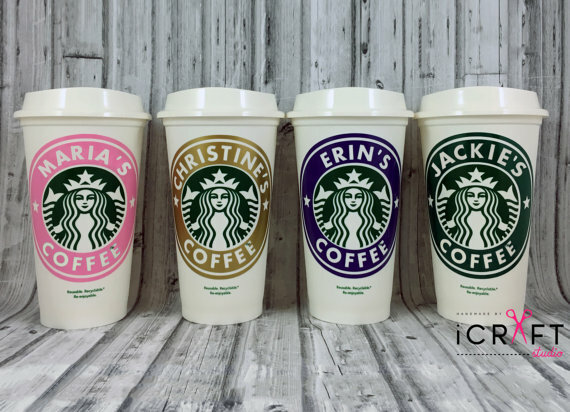 Personalized Starbucks Reusable Coffee Cup $11. Now I'm hip to the fact teachers do NOT want coffee mugs. But how about the TO GO cup? I think this is just THE CUTEST gift. And it works in conjunction with Starbucks "bring your own cup get $.10 off" thing. You can choose the colors, the name, even get a monogram on the lid! The price point is nice too. And it's great for a female or male teacher. Ships in 5-7 days. Plus you're supporting a small business! P.S. Put an sbux gift card in the cup to send it OVER THE TOPPPPP! 2. Facebook "Like" Stamp $15.95+. You know I love a good gimmick. And this is just plain fun. Silly but also useful! You can pick the ink color, customize the teacher's name, etc. Anything personalized makes you seem like you cared. It ships in 1-3 days. P.S. Lezbhonest, the teachers probably wish they could have an UNLIKE stamp to put on peeps papers. 3. A personalized bag (This one starts at $12.47) I bought bags similar to this for Felicity's teachers for Christmas and I think they really liked them! The good thing about this bag (or something similar) is it doesn't look like a "teacher bag", you know? It can be used around town, taken on a weekend trip, etc. Again you can probably sense a theme here: personalized gifts. In the land of Etsy and boutique companies, like Swoozies, you can get a lot of stuff personalized without breaking the bank. Stuff some tissue paper in this and call it a day. Your teacher will love it! 4. Customized Wine Label $6. Let's face it-- after a long school year, teachers deserve some wine! These wine labels are funny and show you don't take yourself (or your kid!) too seriously. It's def for the teacher with a good sense of humor. Each label is $6, but you can find some very affordable wine at Trader Joe's, making this a budget friendly gift. It ships in 3-5 days and you can get a proof before confirming the order! 5. Gift cards! Next to cold hard cash (as one teacher friend put it), gift cards are a great gift for teachers. They can use it on anything their little hearts desire! And you don't just have to throw it in a card and be done with it. There are ways to elevate a gift card and make it better! THIS LINK has printables for Target, the movies, Starbucks, and Amazon! Sticking a gift card on one of these just adds an extra loving detail! 6. A DIY-ish gift. I learned some things from my teacher peoples: they don't want anything apple decor related, and they don't want homemade food. But what about a DIY homemade gift? The Sunny Side Up Blog came up with this fun, "get your teacher excited for summer" gift! A magazine, sunscreen and a towel all wrapped up in a cute bow. Probably $10-$15 to make. You can even do these with male teachers too. Put together a golf magazine, golfballs and sunscreen! You could trade the towel for sunglasses too. (Charming Charlie has some cute options!) The possibilities are endless! 7. A beautiful orchid $12-$20. If you feel like hope is lost, you can always fall back on a TRUSTY ORCHID. They're beautiful, substantial and are very low maintenance. And yes, I am bias toward orchids. #Goals would be to have every surface in my house covered in orchids. This would be my greatest wish. I just feel like you can't go wrong. They are sophisticated. They only require a few ice cubes of water a week. THEY WILL BRING WORLD PEACE. TJs and Home Depot have the best options. Print this tag and tie it on the stem for a beautiful thank you gift fit for anyone! My last idea is that all gifts include a handwritten note by you or your child, thanking the teacher! I always read the cards Joel gets. It's very heartwarming to see a 16 year-old boys chicken scratch handwriting thanking Joel for a good school year. P.S. Don't forget admin and front office people. Now that Felicity is in a "real" school I see just how much admin people do to make the school tick! A mini orchid (TJs $5) is a nice gift just to show your gratitude!